US President George W Bush has described India and America as "global leaders", in an address outlining his vision of a new strategic partnership. 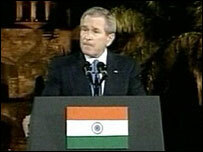 Mr Bush's speech, at a medieval fort in the capital, Delhi, was televised live across India. It followed the finalising on Thursday of a controversial deal on nuclear co-operation between the US and India. "Our agreement will strengthen the security and the economy of both our nations," the US president said. Mr Bush has now left India and is in Pakistan for talks with President Pervez Musharraf. The co-operation agreement, which is still to be ratified by the US Congress, gives India access to US technology, although it has not signed the Nuclear Non-proliferation Treaty. It reverses US policy, which had restricted nuclear co-operation since India first tested a nuclear weapon in 1974. The BBC's Sanjoy Majumder in Delhi says the president's speech was an attempt to reach out to the sceptics and to woo ordinary Indians. His visit to India was marked by a series of protests, mainly by Muslims and left-wing groups, with much of the discontent focused on the American-led invasion of Iraq. Many on the left in India are also opposed to India's closer ties with Washington. As Mr Bush was speaking, news emerged of violence in the northern Indian city of Lucknow after a protest against the US president's visit spun out of control. Four people were killed in clashes between Hindus and Muslims which erupted after the protest. Greeting his audience in Delhi, Mr Bush said he came to India as a pilgrim, "as a friend". "Separated by half the globe, the United States and India are closer than ever before," he said. He emphasised the shared values between the two countries. "Both our nations were created on the foundation that all people are equal." He paid tributes to Indian Americans, including Kalpana Chawla, the Indian-born American astronaut who died in the US space shuttle Columbia disaster in 2003. The US and India were working to "to expand the circle of prosperity and develop the world", the president said. "The freedom that sustains India's democracy is bringing wide changes to India's economy. "All that separates a business in Bangalore from a business in Boston is an e-mail, a text message, a video conference." Mr Bush hailed India's record as a democracy and described it as an example for the rest of the world. "Only one force is powerful enough to replace hate with hope and that is the power of freedom," he said. "Free societies are peaceful societies." Mr Bush's next stop is Pakistan where he will talk to Gen Musharraf about Islamabad's "vital co-operation in the war on terror". He said a prosperous, stable Pakistan was of importance to both the United States and India. "India is better off because America has a close relationship with Pakistan," he said.